Marble Polishing Las Vegas, Marble Cleaning, Marble Sealing Las Vegas. At Carbonated Solutions of Las Vegas, hard work and dedication speaks for itself, we can provide our Las Vegas customers a polished marble finish without the use of artificial products or compounds like the very commonly known “wet look” sealer. These artificial compound will make your floor shine but never in the same way like through the process of diamond sanding and polishing the stone. 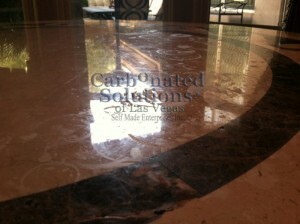 At Carbonated Solutions of Las Vegas, we are rated the #1 marble polishing company in Las Vegas, Henderson, and North Las Vegas. There is no other material that can compare to a perfectly polished marble floor. It signifies splendor, success, luxury when used on flooring and countertop surfaces. A well-protected and maintained polished marble floor can pass the test of time or so we can see in old world structures, sculptures and buildings like the Vatican in Rome, or the Pantheon in Athens just to name a few. Just like honing, marble polishing can be achieved using special grits of diamond pads that close the pores on the surface of the marble thus giving the light its reflection while making the marble surface silky smooth, after that a diamond polishing powder is applied, scrubbed then buffed out and removed to create more shine and uniformity throughout the tile. Stains and acid etching can be prevented simply by sealing your marble surface after it is polished. However a polished marble surface can still not be completely resilient against preventing acid or oils spills from being absorbed by the stone. ATTENTION: any polished and sealed natural stone surface like marble can still be vulnerable to etching and stains after it is sealed. Given enough time foreign substances can erode away the barrier of sealer and create damage to the surface of the stone. A good marble impregnator or natural stone sealer is crucial to helping keep stains and etching from occurring so easily but the best policy is to wipe out any spills immediately after they occur; to do this simply blot the area where the spill happened with water, this helps you prevent spreading the spill furthermore. Keep a good maintenance program according to your needs to avoid having to restore your floors as often. The more you wait, the more work it will take to restore a marble floor or countertop to its pristine original finish and condition. This means the difference between having to pay for restoration work vs. maintenance. Our phone lines are always available to answer your questions.